I know that it came out a year ago and I bought a copy from the UK the week it came out but somehow time flew and I only ended up reading Morrissey's Autobiography this November. This book will have a specific audience so, instead of trying to convince you to read it, let me give you a few tips if you're already planning on reading about Stephen Patrick Morrissey, from childhood through his most recent album. Be prepared to read a book that has no chapters. This is one long, verbose, sometimes poetic, sometimes obtuse, narrative. It is, as you would expect, lyrical. It is also somehow self-effacing and conceited at the same time. "There is no reason for anyone to notice me" can be quickly followed by "Did you see how they all love me". The longest and most detailed part of the book (50 pages) is a very bitter diatribe about the Michael Joyce vs. Morrissey/Marr Smiths-related money lawsuit. To be sure, it was a terrible court case and was the true nail in the coffin of the Smiths, but I would have liked more about Morrissey in the book and less about the horrid Judge John Weeks. Still, this is obviously still a very tender and gaping wound. You cannot read this book with the book alone. You are going to want a computer right next to you. You will need to regularly press play on this Spotify playlist by Greg Thorpe that includes almost all of the non-Smiths/Morrissey music mentioned in the book (59 tracks). You will also need to get out all of your Smiths and Morrissey albums (which you will have because why else would you be reading about Morrissey if you didn't care about the music). You will want the link to the Suedehead video because so many cool things come together when you read about how/when it was made while watching it. It will also be to your benefit to have a search engine nearby because Morrissey likes to mention people without giving any background biographical information about them. A good Google search fills in many a blank. Get the UK Penguin version. 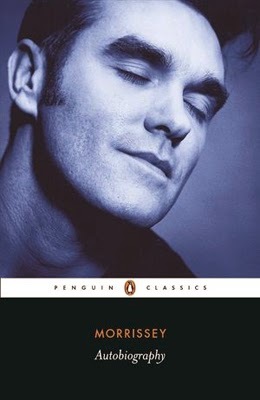 The American Putnam edition is apparently slightly sanitized and it does not have the brilliant Penguin Classics cover that Morrissey demanded. Don't eat meat while reading the book. I have a feeling that he has a way to find out. Reading this book was definitely an experience. There were times when my heart broke for Morrissey and other times when I wanted to slap him. Overall, this book proves that he's human and he needs to be loved just like everybody else does. (Sorry.) I think that the first person that needs to learn to love him though is the one residing in his own skin. Still, I will be queuing up for tickets the next time he is in town to see him (for the fourth time) and let him bask in my adoration. I discovered The Smiths like 4 years ago. Of course now I hear them all over the place (and love their music), but why did it take me so long!! Unfortunately I haven't heard many good things about Morrissey--sounds like he's quite the character.